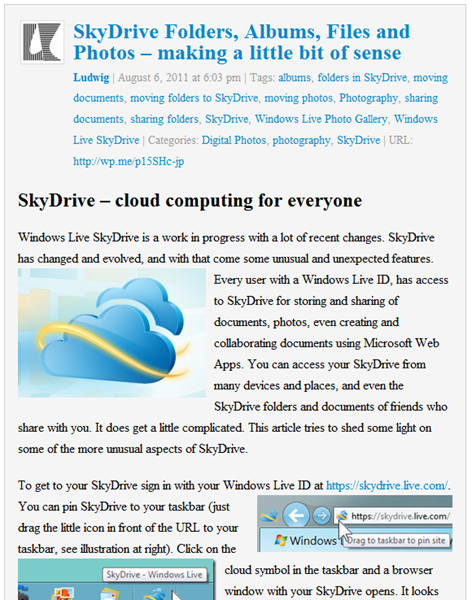 Windows Live Writer has justifiably been listed among the best blogging tools available, and often at the top of the heap. It is easy to use and allows you to prepare your blog in the font, style, and colors of your blog. You see exactly what the post will look like in your blog. Well – mostly. There are some “gotchas” and some situations when WYSIWYG – what you see is what you get – becomes WYSInotquiteWYG – what you see is not quite what you get. Live Writer downloads the design properties from your blog site, your template if you use Blogger, your theme if you use WordPress. 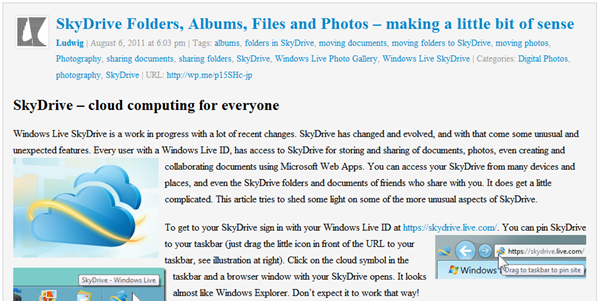 This topic started quite a while back when I selected the “Fusion” theme for this blog and added my own header graphic. 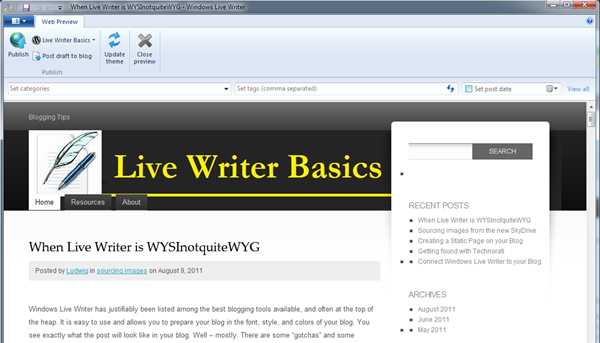 Windows Live Writer does not seem to be able to handle this theme as nicely as it does others. It also downloaded the graphic and overlays it on the text with the result shown in the left illustration. In “Preview” the layout and text is properly rendered. This bothered me, but I liked the theme, so I just started a new post in another theme by selecting one of my other blogs in the Publish group (Home tab). This worked well enough until I overlooked a serious typo in a post – it was hidden by the graphic, and I did not notice it until after I published. Yes, I should have checked it in Preview. Of course, it stood out like a sore thumb once published. I corrected the mistake and republished. This feature works very well, corrections are quickly made. There is a big “gotcha”, however: The feeds and notifications to Twitter, Facebook, etc. are made on the first publication, so they go out with all the errors. I like to include a lot of illustrations, some I set to the left, some to the right, and often I have illustrations side-by-side. 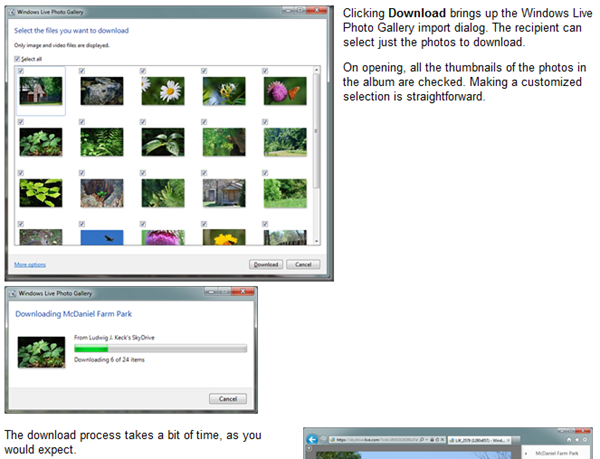 It is easy to leave a bit of room and hit the Return key to move text to below a couple if pictures. It may look “pixel perfect” in the Edit window, and even the Preview often is correct, but in the published post a layout error might creep in. The default margin settings around pictures do not always correspond to the published settings. This also can be a source of positioning errors of illustrations. There is one area where WYSIWYG just can’t work: In RSS feed and email subscriptions. If you offer your readers the option of getting RSS or email feeds of your post, and indeed you should, you need to anticipate what can go wrong when your post is displayed in an RSS reader or in an email. There is, of course, no way for Live Writer to help you with that. Here the illustration did not have proper margin settings for the top and it overlaps text. In this case the text is still readable, but that might not always be the case. My advise: Always set top and bottom margins (I use mostly 5 pixels). Also keep in mind that RSS readers will not render your background color or image, and will likely show the text in black and not necessarily in the color you or your theme specify. I have seen one post where the author switched to white text on a gray background. Google Reader showed it as white text on a white background – totally unreadable. Another text color that is difficult to read when shown on white is yellow. When a reader receives your post as an email all bets are off. Email text is wrapped to fit the window. The display window is totally under the control of your reader. You can see in these illustrations how the appearance of a post is totally at the mercy of the email window. There is nothing you can do about that except to keep this situation in mind. No doubt you will find some discrepancies of your own. Just take WYSIWYG with a grain of salt, or a “not quite” in mind.